The Alpinestars SP2 Gloves take track proven technology and mold it into a street focused package that offers superb protection for every day riders. Full grain leather with multi-panel reinforcements, carbon fiber knuckle protection, TPU palm slider and even a touch screen compatible index finger give you race grade protection that you can comfortable ride all day in. These have been my go to gloves for over 50 degrees for the past two years. They are very well vented, and therefore do get a bit chilly to wear under 50°F for any length of time. They were a bit snug at first, however after a few days in them they broke it nicely and are super comfortable. I used them on two 24 hour rides in the last year and they were comfy as can be. It would be nice if they had a squeegee on the left index finger for light rain situations (for heavy rain I switch to a Gortex sport touring glove), but other than that, these are worth every penny I paid. I found the sizing chart ti be small, originally ordered an XL and that was too small. I love these gloves and wesr them all the time, rain or shine! They breath okay, but if its wet and windy your fingers will freeze. I didnt find they took too long to dry because they dont seem to, like, hold water? Idk. I wore them in the pouring rain and a few hours indoors and they were formed to my hands perfectly. I only wish they put a fave shield wiper along the thumb so I can get the water off my helmet, but... I would definitely recommend these gloves and i would buy another pair. I didn't buy these from RevZilla, but I will be buying another pair here. I went down in these at slow speeds and put the weight of myself and the bike into my right palm. I had some stinging in my hand for a while, but no real damage. The gloves held up well, but the padding in the palm is torn, so I will be replacing them. - They breath ok, but not great. - Went down on the palm, no wear from a small slide. - The stitching holds up REALLY well, no tearing or stitching coming undone. - Would recommend to anyone looking for a full gauntlet style glove. Good bang for the buck. I decided to go with a M on these gloves.I have some icon gloves that are M and they fit me snug and on point but with these gloves they fit a bit larger than a M. I still kept him after I broke them in and they did allow me to have some room to move my fingers and what not. Overall, great protective gloves! I got these gloves as my first pair and they are amazing. I wear an XL and they fit perfectly. The only gripe I have is there is some decals(?) that are on the pinkies that are falling off. Other than that they are perfect gloves. My input on the protection side of things would not be valuable in context of the other reviewers who have crash-tested these gloves. I will focus instead on the other features. The gloves have a sporty look and feel very comfortable. They also breathe fairly well (not great, but it is not a big deal for me as my hands don't get too sweaty in general). What the gloves are missing is a cinch down just underneath the palm, which would make them even more snug. However, the one-velcro closing mechanism does work just fine. My other complaint is that a bit of thread from a stitch has come loose after just 1 month of use. Thankfully, it is in a less-important location around the wrist. Overall, satisfied with the purchase at $100. Although I wouldn't complain if they brought it down to $80 :D.
Great value, Order one size up! I already own a set of AStars SMX2's, but had to pick these up after seeing the closeout pricing. I ordered a size larger (XL) than my SMX2's, and the fitment is perfect. They are comfortable and perfect for the fall. It's currently 95-100 degrees where I live, so I haven't used my SP-2s as much yet. I'd recommend them at the closeout pricing, absolutely! Bought on sale for $100, and for that price these are a great glove! I've had them for a couple weeks, and I've already worn them in 85 degree weather for 40 minutes, and felt like they provided decent airflow, and I've worn them in 50 degree weather (cold for southern California) and they felt great in that too. Obviously can't speak too much to the protection as I haven't gone down, but the knuckle feels really strong. I sized up to an xl per the Revzilla recommendation; I'm normally a Large. They were tight around the hand and knuckle the first 4 or 5 times I wore them, but in the last few days have loosened up, as they're leather, and now they feel great. They have long fingers, which I have too, so they're great for that! I chose these out of a combination of A) high ratings and B) price. Fit is perfect and seems to be very high quality. Closest thing I could find to replace my Dainese Carbon gloves for temperate summer and shoulder-season riding. Wanted a glove that would fit over the sleeve of my riding jacket. because i believed they were ce certified. they are, as gardening gloves. will be VERY reluctant to purchase alpinestars products in the future. I wanted a quality glove for the summer. Turned out to be perfect on my Canada - Mexico trip. Had Dianese gloves before and I wanted something that wouldn't compromise protection but allow more air flow due to the hot riding environment I am currently faced with. My existing gloves of 5 year are simply worn out. I like my Alpinestars boots so I decided to try their gloves. Excellent gloves, but they just don't last too long. They started to fall apart in a little over a year (after 9k miles of riding). I never treated the leather or maintained the gloves in anyway. They fit very well except the pinky finger is a bit long. Great protection and fits with my GP Plus R jacket great at the cuffs. Considered the SP-8 glove as an alternative but after going back and forth between the two, I felt that the added protection and better fit in the wrist area of the SP-2 was the better way to go. As a first time rider, I needed a glove that looks nice and provides a great amount of protection. After watching several reviews and info videos on YouTube, I decided that this glove was the best for my budget of $135. Seems to be the best protection and material quality for street use without spending extra on track-only features. Also like the built in touchscreen ability on the index finger. The material quality looks infinitely more durable than the Dainese gloves I tried on in the same price-point. I tried these pair of fantastic gloves on at a gear shop and they fit amazingly. I love Alpinestar's styling on it and it feels very durable for a very good price. I had this pair of gloves before and wore them almost daily in service as a motor officer. They lasted almost 4 years before large holes developed on the tips of both index fingers. I highly recommend them. Suggestion from Gear Geek. Watched video and trust AStars gear. My current Rev'It gloves and I had a crash and are worn through the palm. These appear to provide better protection and have good customer reviews so hopefully they'll work out well. Cool gloves and for the protection. Alpinestars make good gear overall. I verified my glove fit in a store with another model, but the store didn't carry these. I have big hands, so most brick-and-mortar stores are out of my size. Sturdy knuckles and high quality construction. Great for spring and summer riding here in Northern California (Oakland). After a year the velcro patches don't work as well as when new, but otherwise these gloves are holding up well. I have not been down wearing these, so I can't comment on the knuckle armor. Alpinestar reputation, price and features. Alpinestar product.. Well Priced.. I bought a jacket that was Alpinestar so I had to complete the look. Did the research and looked like a great product.. Dont listen too all reviews..
Had an accident and had some wrist road rash even though I was wearing a shorter glove and a Rev-It jacket. Upgrading all riding gear for additional protection. An accident will make one think more about riding gear. same, a replacement for my old sp2. Good reviews for a sporty street riding glove. awesome gloves. have been riding with them for 4 months now. Full gauntlet, so they're hot, but super comfortable and amazing protection. I will say that i did go down in these gloves at around 45 mph. they were flawless, but more important, my hands were in perfect condition after the wreck. I had a pair before, 2011's or 2012's. Great gloves, lasted summers and winters! Current alpinestars gloves i have are outstanding and have lasted through a lot of wear. Because Alpinestars is legit, too legit to quit. 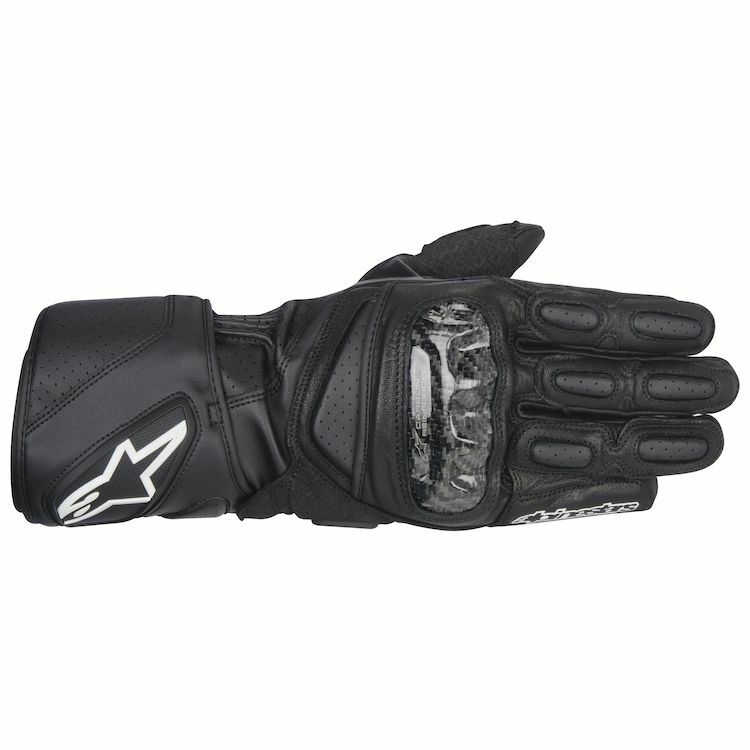 i am wearing a size XL alpinestars Masai gloves, will the same size in the SP-2 fit ? Product description says "Wide Velcro wrist closure". I ride with a Dainese leather jacket - will the gauntlet on the SP-2 fit over my sleeve? Yes, I where them with my Dianese leather and Textile jackets without a problem. The cuff size is completely adjustable with a Velcro outer band. How well does this product fit over my astars suit? BEST ANSWER: Mine fit perfectly fine. I have no proble fitting it around the sleeve and there is plenty of contact on the velcro that it will hold all day. My SP-2 gloves BARELY fit around mine. Anyone owned these 2014 model gloves for 10,000+ miles with regular use? I'm curious about their longer-term durability. BEST ANSWER: I am over 8K in these gloves in hard weather and rain. They are simply amazing. The color has faded a bit, but I blame th florida sun more than anything else. I can help a little, but not directly to your question. I used these gloves on the track for about 1000 miles then crashed in them. They broke in well, we're mint before the crash and protected very well in that crash. They are my 3rd pair of A-star gloves and the other 2 pair have lasted well for years. I'll always wear A-star gloves. Good luck with your decision & purchase. I've had these gloves for a while, right about 7k miles. The index finger and thumb seem to wear in color but nothing to stop it's usefulness. If anything they fit perfect to my hand and feel amazing still. Would these be good gloves for winter riding? No rain or snow....just 30-40F weather. BEST ANSWER: No, i wouldn't wear these in 30 to 50F weather unless its an extremely short ride. The cold air doesn't necessarily cut through them like other gloves but your hands will still get numb over a 20 to 30 min. ride. No I wouldn't use them that cold. There is no insulation. I am curious how these glove will fit over my Astars suit? BEST ANSWER: I have the dainese cage leather jacket. I'm 6", 175-180lbs, slender to althetic build. I wear a size 50-52. These gloves fit over the jacket without any binding issues. I have not had any problems with the gloves and jacket being too tight together at the wraist. The only two issues with the setup is there is no airflow going up the arms (to be expected) and the cuff (where the star is) doesn't seal all the way. Meaning that with the jacket on and the cuff going over the jacket, the radius of the jacket doesn't allow the cuff to fully overlap the Velcro. It still has enough to grab (3/4 inch for my setup) so I would worry too much. I would still run this setup knowin what I know now. I hope this helps you. They will go just fine over anything. But for sure I would spend $50 extra and get myself a real deal. Interior is pretty rougth and I find fingers too short. But it's just me! I have an A Stars Jaws jacket. It has a small velcro strap for adjustment at the cuff and zippered sleeves and the sp2 gloves have worked fine for me. I hope this helps. What temps would these fit in at? Looking for something to wear between 60-75 deg F.
BEST ANSWER: They are not insulated. Nor are they very ventilated. I think most people would find them a middle temperature glove. I wear them at almost all temps but i value protection more than comfort. You're far more specific about temperature ranges than I am, but I've comfortably worn these gloves between 60 and 75 degrees. There was enough wind protection at 60 as not to feel cold and they vent well where 76 feels very comfortable. I've worn these gloves down to 40 degrees (a bit cold) and up to 90 degrees with no major complaints. How are these in the heat (85+ degrees)? BEST ANSWER: I own the Black and White version and live in Austin Texas. They don't breath as well as the Cortech gloves these replaced. However I don't find them unbearable on hot days. I'm not sure I'd like them if they were all black. Will these gloves be acceptable for use at a track?